Ten years ago, a containership sailing between Asia and Europe would be underway almost 9 weeks on average. Today, this has increased to more than 11 weeks. Slow steaming and ever growing ships are the main reasons for this slowdown. What does all this do to your transit times and what does it mean for you? 2008 was the year in which the oil prices saw a gigantic rise in price. Shipping companies searched for solutions and found one in ‘slow steaming’. Container ships sailing at low speeds save tonnes of fuel, after all. As such, slow steaming would achieve millions in cost savings. As well as lowering costs, slower sailing also means fewer CO2 emissions. The financial and environmental savings mean that slow steaming is still very popular in 2019. 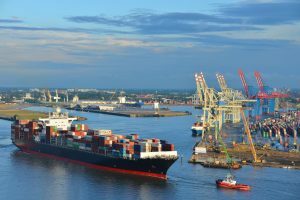 It is thought that this will only increase after the new IMO legislation comes into force on 1 January 2020. For instance, new sailing routes between Asia and the Netherlands have already been announced, showing 13-week transit times. Another trend emerging over the last few years are the megaships that are used for sea freight transport. Where the largest containerships in 2009 could carry around 15,000 containers, this number has now risen to 21,000. As less fuel is required per container, there are cost savings for shipping companies. More cargo on board also means longer loading and unloading times. This is how megaships are causing longer transit times. This year will see many new megaships once again, taking the place of smaller ships. The result is even longer transit times. Containerships may be sailing more and more slowly, and loading and unloading megaships takes time. In contrast, the most recent changes in sailing routes show that a decreasing number of ports are included in single routes. Also, the shipping companies are sailing at higher frequencies along a larger variety of routes. This should prevent delays and increase reliability. There may be weeks of difference in transit times per sailing routes between Rotterdam and the country of origin. However, it’s not just the number of days on the sea that is significant. For example, choosing a route whereby Rotterdam is the first unloading port in Europe reduces the changes of delays. At Ritra Cargo, we always pay attention to these types of details, to select the fastest and most reliable sailings for your sea freight transport. If you have any further questions about the transit times from Asia, please contact us on 010-7671000, or send an e-mail to info@ritra.nl.